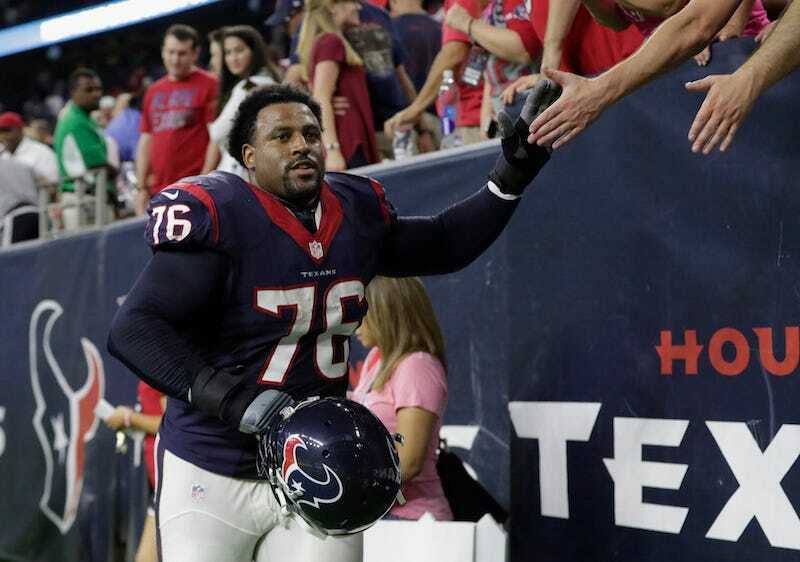 Duane Brown is testing the system. Brown, who is about to enter his 10th season as the Texans’ starting left tackle, has not reported for the start of training camp. He has two non-guaranteed years remaining on his contract, and he wants a new deal. Brown has already skipped Houston’s offseason program—he was fined $80,405 for it—and he appears to be ready to dig in his heels even though the current collective bargaining agreement is structured to discourage holdouts like never before. Will he succeed? Brown is leveraging his experience and his ability at a prime position. He’s missed just 12 starts across nine seasons, and even though he’ll turn 32 next month, he’s still one of the better-performing left tackles in the league. Per Pro Football Focus, Brown ranked just 27th among all tackles (left and right) in pass-block efficiency last year (95.0), but he was one of only two to have played at least 370 pass-blocking snaps while allowing just one sack. Per NFLPenalties.com, he was whistled for holding just once and had zero false starts. The Texans are grooming first-round pick DeShaun Watson behind Tom Savage at quarterback, and Brown is someone the team very much wants to have around to protect its investment. In 2012, Brown signed a six-year extension that runs through 2018. According to spotrac.com, he’s already earned more than $23 million from that deal, and well north of $30 million for his career. Per overthecap.com, he’s slated to earn $9.4 million this season, and $9.75 million next year. This offseason, owing to a weak draft class at the position, the market was fairly strong for free-agent left tackles. Russell Okung ($13.25 million in AAV), Riley Reiff ($11.75 million), and Andrew Whitworth ($11.25 million) all cashed in, while the Packers retained David Bakhtiari at $12 million. Reiff ($26.3 million), Okung ($25 million), and Matt Kalil ($24 million) all got significant guarantees, per overthecap.com. And even Whitworth, who is 35 years old, got $15 million guaranteed. Brown would prefer to be paid more in line with where the market now stands—especially because he’s guaranteed nothing in 2017 and 2018, which means the Texans can cut him at any time without paying him another cent or enduring any kind of cap implications. Brown has no recourse that would allow him to tear up the terms if he wanted to do so. Which is why he’s holding out. This is where it gets tricky. The current CBA mandates per-day fines of $40,000 for holdouts once training camp begins—the previous CBA carried fines from $14,000 to $16,000—along with the loss of an accrued season for any player who fails to report by 30 days before the start of the regular season, which this year would be Aug. 8. Thus far, these rules have largely worked to keep players from holding out. But with his career earnings to date, Brown presumably has enough in reserve to allow him to pay the heavy fines he stands to accumulate with a lengthy holdout. And his status as a fully vested veteran means he will largely be unaffected by the loss of an accrued season. He’s doing this because, unlike most NFL players, he’s comfortable enough to try it. The only question now is how effective Brown’s holdout proves to be. Seattle safety Kam Chancellor attempted a similar holdout two years ago. He extended it past the first two games of the regular season, both of which the Seahawks lost. But despite piling up nearly $2 million in fines and lost earnings, Chancellor returned to the team without wringing a single concession.